Sgt. 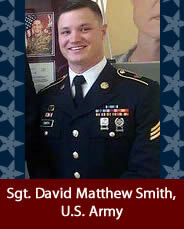 David Matthew Smith, U.S. Army, age 24, formerly of Sandusky, died unexpectedly on Nov. 14th, 2016 at Lewis McCord Army base in Tacoma Washington. Smith was born on June 23, 1992, in Pineville, Kentucky, and was a 2010 Margaretta High School graduate and a captain on the wrestling team. He attended Bowling Green State University until his enlistment in the U.S. Army in 2012 where he excelled in his military training and was transitioning to become an Air Defense Early System Operator.